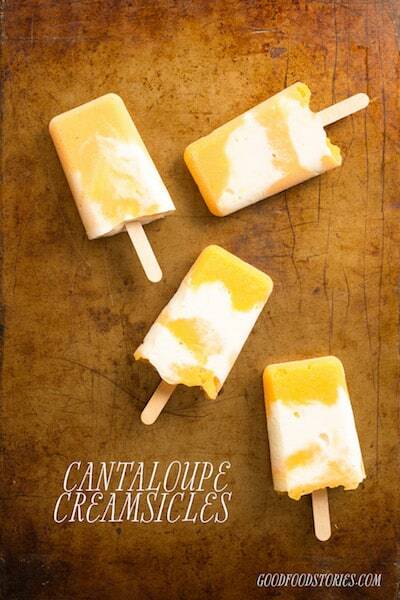 Cantaloupe Creamsicle Recipe | Good. Food. Stories. Cantaloupe has played second banana to other fruits for way too long. 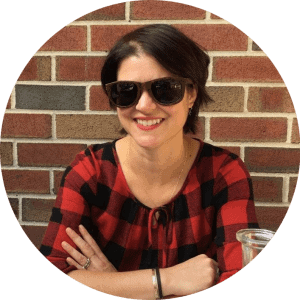 Think about where you most often encounter it: as a wan wedge next to your brunch omelet, as sad slices fanned out on a hotel breakfast buffet, as chunky cubes of fruit salad filler. If a cantaloupe is particularly lucky, it might get a savory wrap of prosciutto to boost its standing, but otherwise this pastel fruit gets the shaft, paling in comparison to its ruddy cousin the watermelon and the more exotic pineapple. The only thing lower on the totem pole than cantaloupe is honeydew. I’m not here today to help poor honeydew, but I do think it’s time to change the cantaloupe conversation. And since no one can resist ice cream, that’s the first step in its image rehabilitation—a transformation into sweet and creamy cantaloupe creamsicles. As someone who literally wrote the book on homemade snacks and treats (cough cough, Classic Snacks Made from Scratch, cough cough), I do have a method for making creamsicles that look like the old-fashioned pops of our youth, with ice cream encasing a chilly fruity core. It involves two different sizes of paper Dixie cups and two rounds of freezer time to get everything looking just right. But for most people, making two different bases—one cantaloupe sherbet and one soft serve-style vanilla—is enough work, and we’re here to maximize our enjoyment. This method doesn’t require special equipment beyond regular popsicle molds in any shape you prefer. Rockets, stars, classic rounded rectangles, it’s your world. Though if you have a Zoku maker (a little high-maintenance and more frustrating than it’s worth, IMHO), you’re more than welcome to use that. With a spoon and a swirl, you have a much more low-maintenance way to get that classic creamsicle combination of creamy vanilla and icy fruit—only this time, the kiddie orange has been replaced by a subtle melon flavor. It’s brightened by a squeeze of lime and given a smooth bite with a splash of cream (that’s what makes it sherbet, dontcha know! ), but it’s still definitively cantaloupe. And a clever way to use up less-than-perfect melons at that. To make the creamsicles quickly and efficiently, you’ll need an ice cream maker with 2 freezer bowls. My trusty standby, the Cuisinart ICE-21, is often sold in a bundle with a second bowl, but you can always buy a separate extra if you already have the ice cream maker. If you don’t have a second bowl, you can make the sherbet first, then wash and re-freeze the bowl (though this will add another day to your prep and assembly time), or scrape out the sherbet as best you can, then pour the vanilla base into the bowl without cleaning or re-freezing. You may get some sherbet streaks in your ice cream and it may take a few extra minutes of churn time to get the vanilla ice cream to the right consistency, but if you can live with that workaround, go for it. Blend the cantaloupe, sugar, cream, and lime juice in a blender until pureed. Refrigerate for at least 4 hours or overnight until completely chilled. Bring the cream and sugar to a simmer in a small (1-quart) saucepan over medium-low heat, whisking frequently until the sugar is dissolved and small bubble start to form around the edges of the cream. Transfer to a clean bowl and whisk in the vanilla extract. Refrigerate for at least 4 hours or overnight until completely chilled. Make the sherbet first in your ice cream maker, churning for about 10-15 minutes until the sherbet is thick. Transfer the sherbet to a freezer-safe container and keep frozen while you make the vanilla base. Make the vanilla ice cream next (in a clean ice cream maker bowl or in the same bowl as noted above), churning for about 10 minutes until the ice cream has frozen to soft serve consistency. While the ice cream churns, get your popsicle assembly line ready, making sure the molds are ready to be filled and placing them on a rimmed baking sheet for easy freezing if necessary. 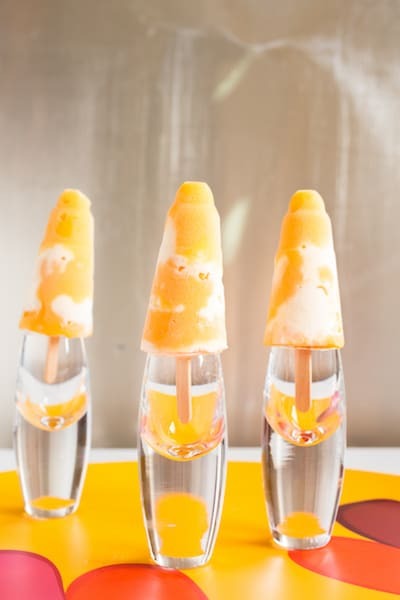 To make the creamsicles, spoon 1-2 tablespoons of the cantaloupe sherbet into each popsicle mold, then top with 1-2 tablespoons vanilla soft serve. Repeat until each mold is filled, gently pushing the sherbet and ice cream into the molds to swirl them together. Shake the molds gently to let the creamsicles settle and remove as many air bubbles as possible. Insert popsicle sticks or any sticks that came with the popsicle molds. Freeze the popsicles for at least 4 hours until completely hardened. Run the molds under hot water to remove and serve immediately (duh! ).